Oleksiak also scratched her 100 free and 50 fly earlier in the meet. Defending NCAA Champion Austin Katz will swim the 200 back on Saturday evening at Big 12s. Stanford has the most A-finalists on Saturday night, led by Taylor Ruck in the 200 back. Saturday’s prelims session will include races in the 200 back, 100 free, 200 breast, and 200 fly, with platform diving, the mile, and the meet-closing 400 free relay closing the 2019 championship. 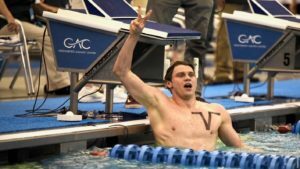 The Texas Longhorns have a tight grip on both team titles, though for the Texas men, West Virginia pulled a little too-close-for-comfort at moments. Texas’ Tate Jackson, who has been absent from the last 3 sessions of the meet, is on this morning’s heat sheets in the 100 free as the top seed. Tate Jackson declared a false start in the 100 free, even though he was on the heat sheets, which means he still hasn’t raced since Thursday morning. Texas senior Quinn Carrozza is lined up for another dominant 200 backstroke win at the Big 12 Championships. After winning by 2.6 seconds at last year’s meet, she has a 2.8 second advantage in prelims this year over Kansas’ Elizabeth Amato-Hanner (1:56.35). The Jayhawks actually took the 2-3-4 spots in prelims: all in season-best swims. The defending NCAA Champion Austin Katz wasn’t nearly as fast as his Meet Record from last year’s finals in this morning’s heats of the 200 back. He was, however, much faster in this morning’s heats than he was in last year’s morning heats, which could be foreshadowing for a big swim tonight. Katz swam a 1:41.03, which was almost a second better than the 1:41.8 that he swam in prelims last year. He’s already been an NCAA qualifying mark this season, so there’s no big pressure to do much in finals. Claire Adams took her 2nd #1 seed of the day, this time in the 100 free in 48.36 (where she’s also the defending champion). Freshman Julia Cook, who has 2 silver medals already at this meet, qualified 2nd in 48.53. With defending champion Tate Jackson declaring a false start, it was freshman Daniel Krueger who took the top spot in the men’s 100 free prelims. 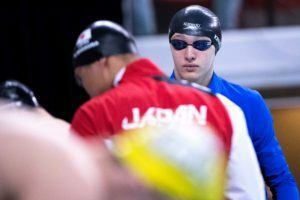 He was followed by classmate Drew Kibler (43.58) and Longhorn senior Townley Haas (43.81) in the morning heats. Krueger was already a 42.31 in a time trial on Wednesday in this event. 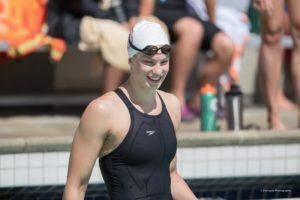 In an event that is the Texas women’s weakest, West Virginia senior Emma Harris took the top spot in prelims of the 200 breastststroke in 2:12.63. She was followed by Kansas’ Kate Steward in 2:12.98, both well ahead of the first Longhorn qualifier Holly Jansen. Harris swam a 2:09.93 in a time trial on Tuesday that lands her squarely on the NCAA qualifying bubble. Dropping a tenth in finals would jump her 2 spots in the National rankings, while dropping two-tenths would jump her 4. Those spots could be crucial in determining her NCAA Championship fate. Texas freshmen Braden Vines and Charlie Scheinfeld took the top 2 qualifying spots in prelims of the 200 breaststroke. Vines, who won the 400 IM on Friday, finished in 1:55.67, which was ahead of Scheinfeld, who won the 100 breaststroke on Friday in 1:57.05. 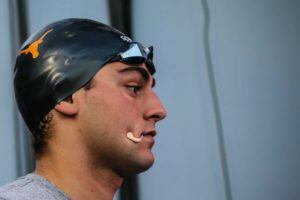 Scheinfeld has been a 1:52 this season, so he’ll be the favorite in finals, even with a slower prelims swim. In her last, and best, chance to lock up her 2nd-straight NCAA National Championship invite, West Virginia’s Morgan Bullock swam a 1:56.65 in prelims of the women’s 200 fly. That’s a new season-best for her by 8-tenths of a second, but she’ll need to drop at least another half-a-second in finals to move onto the invite bubble. Texas Remedy Rule and Lauren Case, the top 2 seeds coming into the meet, qualified 2nd and 3rd, respectively. 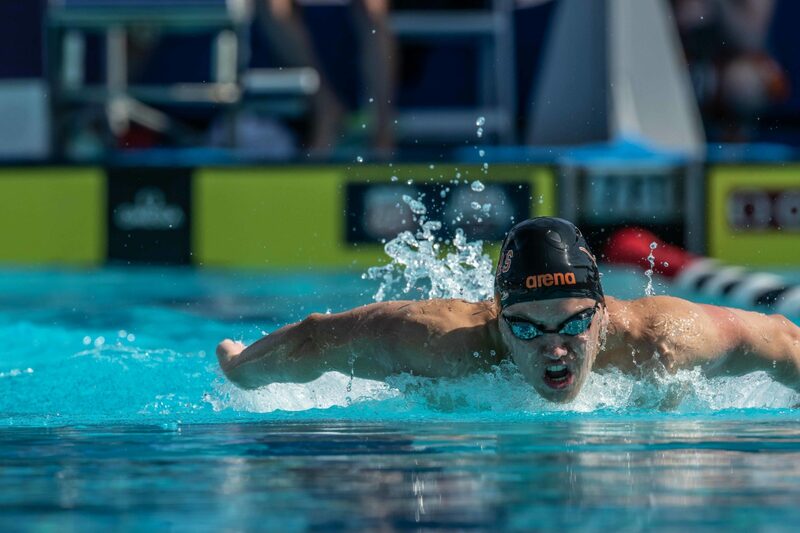 Texas’ Max Holter was the fastest swimmer in the heats of the men’s 200 fly, buut once again will be bumped to the B-Final as a member of the men’s non-scoring team. He swam a 1:43.08 in prelims, though he likely secured his NCAA spot with a time trial earlier in the meet. That means lane 4 in finals will belong to his teammate Andrew Koustik, who swam 1:43.24. I am starting to feel bad for Max Holter. It is always nice to say you won a title. Yeah, that’s no fun.. but it’s also pretty cool making the Big Show from the B team (& most likely scoring at the meet)! This meet is killing me. A 43.32 would be 16th at ACCs. So sad. 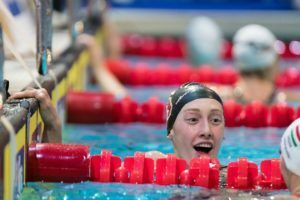 Do all the other conferences have caps on the number of swimmers/divers they can bring? I am not understanding the exhibition swimmers at a conference championship meet. You are either on the conference team or you stay home everywhere else it seems. Aww don’t be sad ya Silly Goose! We’ll see you at NC’s when we’re shaved and tapered and you’ll feel silly for worrying for nothing! Newkirk explained in a video the taper they have been doing the “past few weeks” I think are the words he used. Full taper no, but they are definitely in a taper. Texas is good but they aren’t superhuman. I get your frustration but Texas Guys by and large have their cuts. There’s no need to shave and taper for this meet or any of the conference meets when NCAA’s are the goal and you have your cuts.